Sometime this week, the first cars will be sent out to Hornell NY. what work are we talking about here? a complete mid-life rebuild? electrical, seats etc? Complete top to bottom rebuild. Much like the 300 series cars that became 200 series cars in the same factory. I believe the scope is to bring the cars up to match the Rotem series cars, complete with a digital trainline communication system. From what I hear the cabs will be totally upgraded to match the 1800-seires and power doors will all be activated. Why would the K cars be switched over to power doors? The reason most of them have doors set to manual is because someone has to be physically present to open the trap at low-level platforms. That situation shows no signs of changing anytime soon. So far the coaches/control cars that are being prepped for shipment are: 716, 739, 743, 745, 1701 & 1704. If they're being brought up to Rotem specs, does that mean they're also getting a 90 MPH speed limit uprate for use with the HSP-46's on the Providence Line? Where did you hear 90 mph on the providence line with the hsp46s? wow that is a lot of work, they are going to be beauties when they return....will they get paint jobs as well or will that be as needed? the 1700 needs it badly....that is a lot of work, can we assume, 2 months worth of work per car? AEM7AC920 wrote: Where did you hear 90 mph on the providence line with the hsp46s? Both the HSP-46's and Rotem bi-levels are rated that fast. They could run 90 if the trainsets assigned to Providence were put together out of nothing but >79 MPH equipment. Whether they will do something like that is a moot point today with the deliveries not finishing for 2 more years and any additional deliveries from the as-yet-unexercised escalator clauses not finishing for 3-4 more years. That's not a conversation they're going to be having in detail until the deliveries reach critical mass. I'm asking the question because it would be a hell of a lot easier to put together 90 MPH trainsets if the equipment supply were flushed fuller with a second class of uprated coaches. And the question is relevant because of the power doors upgrade. As noted, there aren't enough lines with highs to merit expanding the power door fleet by that much. Fairmount is closest with only Fairmount + Readville left to raise at modest expense, but Fairmount doesn't need that extreme a quantity of cars to flush its schedule full. Providence, though...it's in Amtrak's NEC Master Plan to get all the CR stops at full level boarding. With fed funding likely paying for a lot of it because the specced improvements include platform modifications for intercity passing tracks at South Attleboro, Mansfield, Sharon, and eventually Hyde Park...with Readville getting work to double-track the Franklin-side bottleneck. That all is on a timetable to happen well within the rebuild lifespan of these cars, so it's a relevant question if the K's are also being prepped to run in 90 MPH trainsets. The current engines are good for 90 as well the issue is still going to be if you have a flat or the doubles that aren't upgraded then the chances of all rotem sets is slim to none. 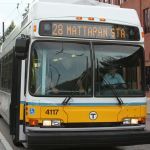 The timetable lists all mbta coaches 80 max so 90 is a longshot at this point. What is a trainline communication system? Is this a scrolling digital display similar to what the subways have? Also, in regard to power doors, are they that much of a disadvantage when working with low level platforms? I've been on an all power door set on the Providence line before, and it seems that the conductor or AC either keys the door then pops the trap or pulls the door release and opens the door manually. enterprise11 wrote: What is a trainline communication system? Is this a scrolling digital display similar to what the subways have? I'm not positive what trainlining means for the commuter rail, but on the subway, you can only trainline if all of the cars on the train have the same/compatible software in their computers. The 01500s, 1600s, and 1700s on the Red Line are not capable of trainlining with the 01800s on the Red Line, thus, the 01800 cars are always segregated into trains by themselves. If you're in a train that isn't capable of trainlining, then the PA system won't work throughout the train. In fact, the train might not even be capable of operating at all. Trainline allows for communication between the coaches as far as hep, communications etc etc. The new coaches are suppose to have a diagnostic screen in the cab car that displays info on the train and locomotive so everything will need to be on one page to function properly. and PAR-NS to Hornell and return.